All hail heavy metal. 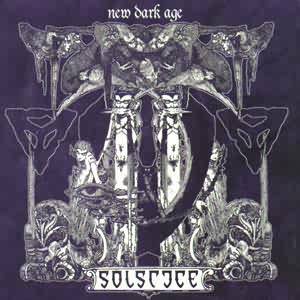 Solstice have returned with a massive helping of illustrious doom metal that eclipses every thing else I've heard this year ('99). As weeping Celtic melodies effortlessly collide with volcanic Candlemass inspired doom, grandeur and sorrow mix in a beautifully darkened atmosphere. The mid-range vocals dip and soar over the ashen aural landscape, literally dripping with emotion. Awesome, spellbinding stuff. This is what it's about. Forget the current crop of power metal acts trumpeting the cause through endless posturing and hopes of empty mainstream glory. New Dark Age is pure heavy metal at it's finest, and most sublime. This is music for the soul. The overwhelming sense of resignation and introspection won't be denied. The music doesn't go out of it's way to impress, but it's so damn sorrowful and honest that it's utter holiness never ceases to amaze me. The songs are interspersed between acoustic interludes and ambient sounds. The effect is profound. The album, as a whole, is a masterwork of balance and dynamics. By the time "Cromlech" (one of my candidates for song of the year) rolls around, you will have been converted. This album is at the forefront of the recent doom metal revival. Along with the latest efforts from Morgion, Solitude Aeturnus, Sheavy, Cathedral and Las Cruces, doom has to be considered the creative center of heavy metal circa 1999. Perhaps it's the approaching millennium, and all of us atheists are entertaining unspoken fears of judgement. Doom is in the air, and New Dark Age is it's figurehead.